I love love love to get emails and comments from my readers. You are the most interactive, inquisitive and amazing community of readers! SERIOUSLY! I mean that! Many of my readers ask the same questions and when that happens I know it’s time to write a blog post about it. 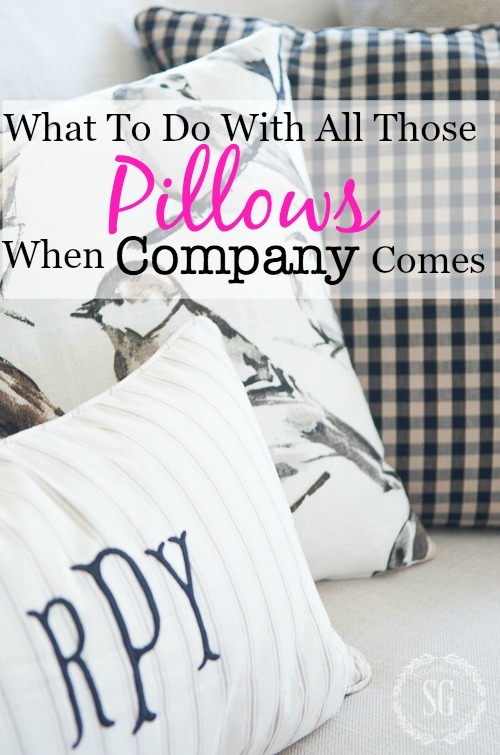 I’ve had so many StoneGable readers asking me… “what do you do with all your pillows when company comes”. This is a brilliant question. Oh, you know I am a pillow addict! For years, I really did not know what to do with them. They either got crushed by backs and bottoms and arms or tossed on the floor and trampled. Neither was a good solution for my pillows or my guests. But several years ago that changed. And now I’m sharing the most perfect solution for the battle between pillows and company! I love a sofa piled with pillows! But I also like a sofa full of company. What’s a girl to do? I leave the pillows on my furniture and just mention to my guest that I’ll take the pillows if they don’t want to rest on them. Some` people like the pillow and other’s don’t. I leave that up to them. All unwanted pillows go in this big basket. And they look pretty too! I have pillow baskets in my living room, family room and all of my bedrooms. 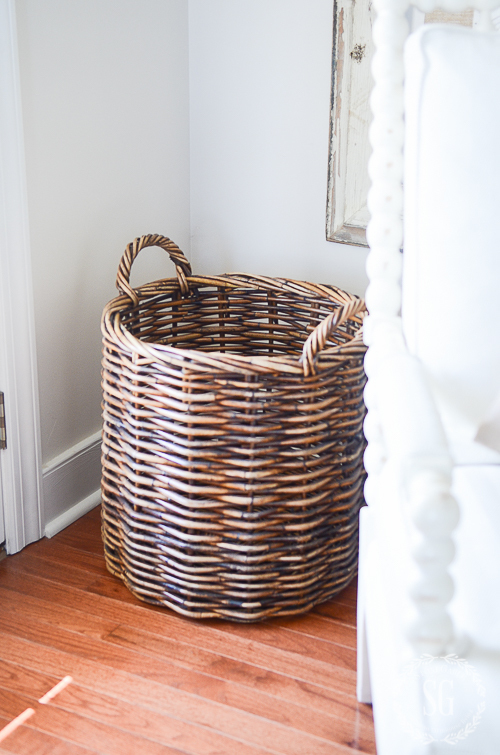 The baskets can add style and texture as well as function to a room. I like a big woven basket or even an old wooden chest. How about using a wire basket, wooden crate on wheels, a covered basket one lined with a great fabric. The ideas are endless… and fabulous… and functional! stow pillows in a basket when company comes! Hey, friends Kathy asked in the comments about the inside of the basket. Just make sure there is nothing inside the basket that could snag or damage precious pillows. Thanks for bringing that up Kathy. Fabulous StoneGable friends!!!!! 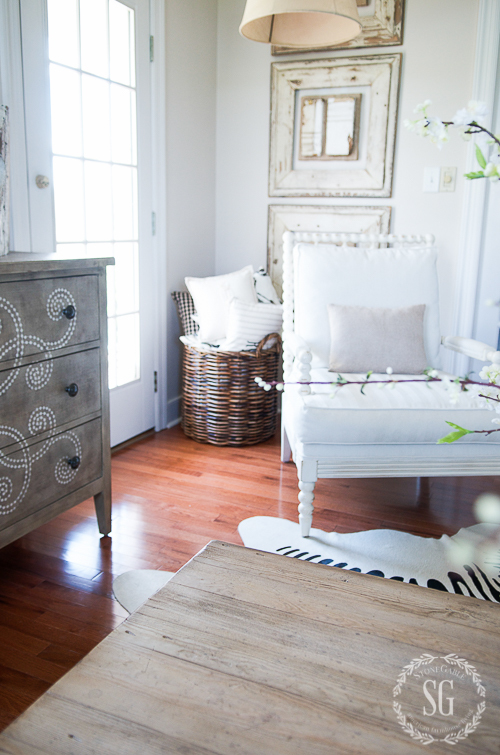 I love easy-peasy solutions to home decor dilemmas, don’t you? How will you implement what you’ve learned today? Tell me about it in the comments! What’s your favorite site for pillow tops? Do you mean pillow covers? I love Ballard Designs, Pottery Barn and even Pier 1. They are reasonable and are pretty good quality and have a nice style! Yvonne, thanks so much for this post! I have always had this problem and like you, I love to have pillows on my sofa but my guests always seemed so uncomfortable. What am I going to do? I am going out today to find me the nicest basket I can find! I am fairly new to your blog and am loving it! Thanks so much! I like lots of pillows both on my living room furniture and beds. 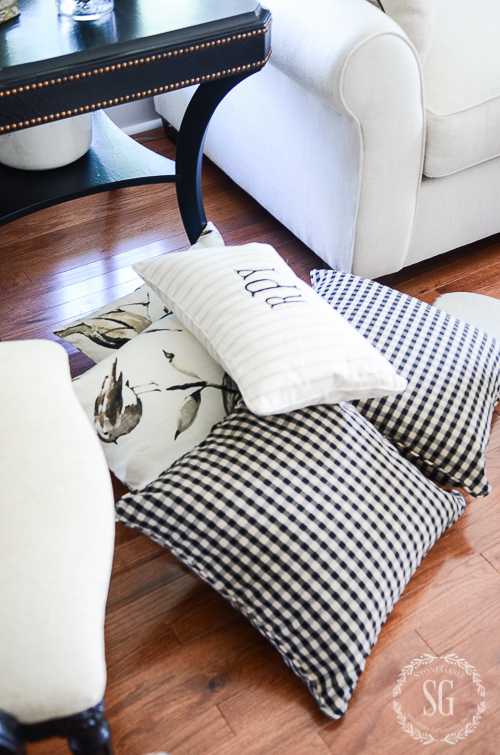 The bedroom decorator pillows rest on a bench but living room ones always end up on the floor. As a basket lover, why have I not bought a one big enough to hold those cushions? I’ll be on the lookout for the perfect basket. I LOVE throw pillows on my sofas. I also like them on the sofas where I am a guest. I am short and often times need a pillow or 2 at my back because many sofas seats are so deep. The basket idea is so nice and neat for those lucky tall people who don’t need them! 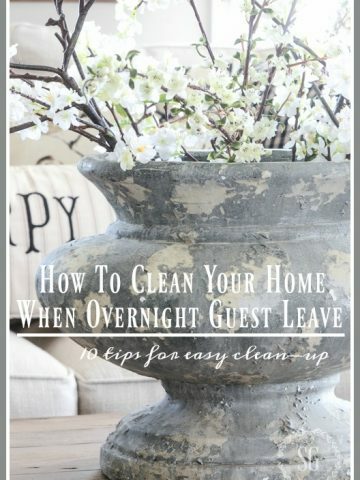 My only question is, do you remove the pillows yourself before guest sit down, or wait for them to remove them in which case most guests would feel self conscious doing that in someone else’s home. 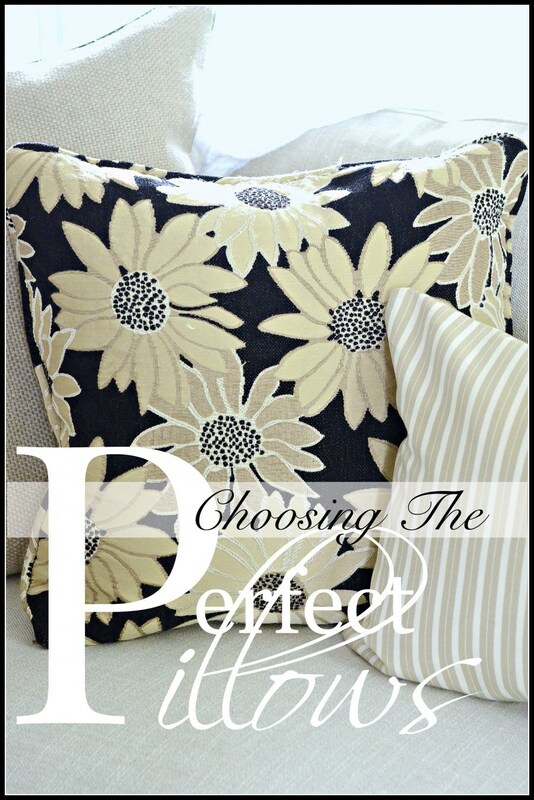 I’m sure one of the reasons we like decorative pillows is for the decor factor that we enjoy others seeing. So it would seem that we should remove them when guests are present and about to sit down. Think we also have to let some guest sit on or crush pillows to lean on and realize that people and their comfort is most important, and I’m sure you would agree. 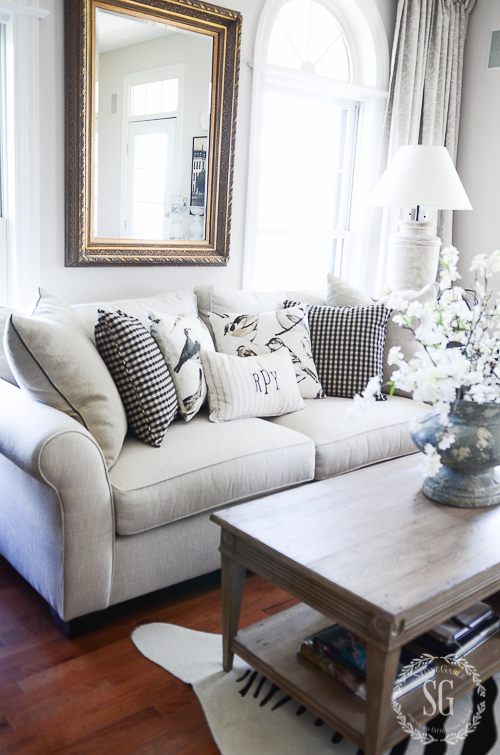 If a pillow is too delicate then the host should remove it well before seating guests. To me a sofa doesn’t look inviting to sit on if there are too many pillows, especially on a smaller sofa. Just my opinion. Where are these bird pillows and check pillows from? Love! Thanks! Where did the bird pillows come from ? LOVE them !!!! For me, the best place to find them is at HomeGoods. I love your passion for decorating. Thank you for sharing your home. I love even more your passion for God’s Word. You have been such an inspiration to me. I love sitting on pillows and whenever I see a sofa with a bunch of pillows, I stack a few on top one another and sit on the whole mound; I just love sitting on layers of squishiness. To me, I feel that I’m making full use of pillows when I’m sitting on them and I find it pretty comfy. Yvonne, I too love pillows lots of them in fact and I have invested in some lovely ones and have even whipped up a couple from your diys. We have company who will sit and fiddle around trying to adjust the pillow and finally set it on the back of the couch and ultimately by the end of the visit they will slowly tumble to the floor. Others will stack them on the floor or to just use them as something to hug. Even the dining room cushions are raised and used as a back rest. So, to remedy the problem I will have to get a large basket and hopefully visitors will get the idea with a little nudge from the hostess. Love your posts and look forward to your wonderful solutions. 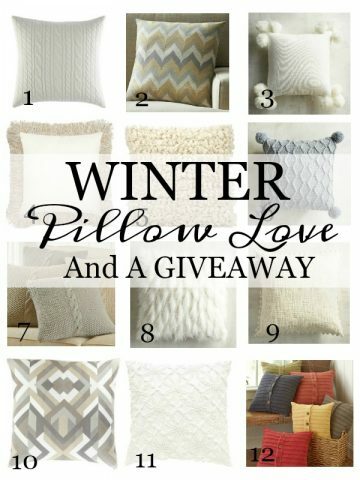 I am so excited fellow pillow addict and I also have a antique basket like yours! 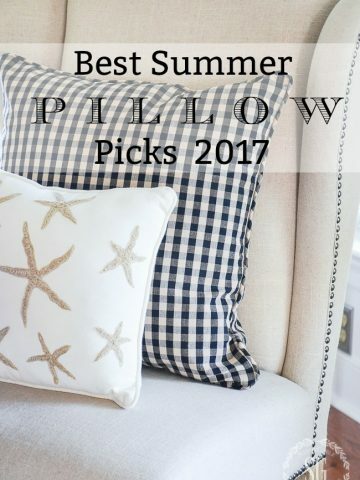 My husband is always saying something about all my pillows and most guests don’t know what to do with them or don’t sit near them! Lol…..now the answer! You know I have a basket upstairs I use as part of my stair landing for pillows, I never connected the two! Thank you Yvonne! P.S. just completeing a major remodel and new kitchen I designed and kept my current table and hutch and cabinets! I designed it! So love this clever and unique way to contain my pillows!! My husband will so rejoice!! No onto HomeGoods!! 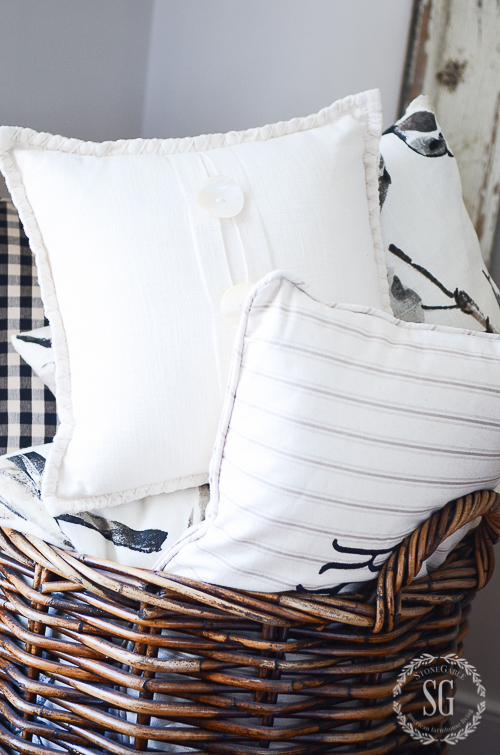 Did you make those gingham pillows? If not, where did you find them? Hi Patti, the pillows came from Ballard Designs. Hope this helps. Great tip! Always open your posts first thing in the morning! I love pillows too…thanks for the basket idea. I already have the perfect one for my great room!! Great idea! I already keep a willow basket like the one you showed, for throws. Plus, I love baskets, any reason to buy a new one, is good for me!! Thanks great idea! I am having a hard time pickicinf the right pillows to go with my sofa! I will find them! Now I know what to do with the vintage wooden crate that that I got at an auction! Thanks for solving my problem. LOve the basket hospitality for friends who never know what to do with all my pillows. Great idea! I use one in our guest room and am on the lookout for something for the great room. 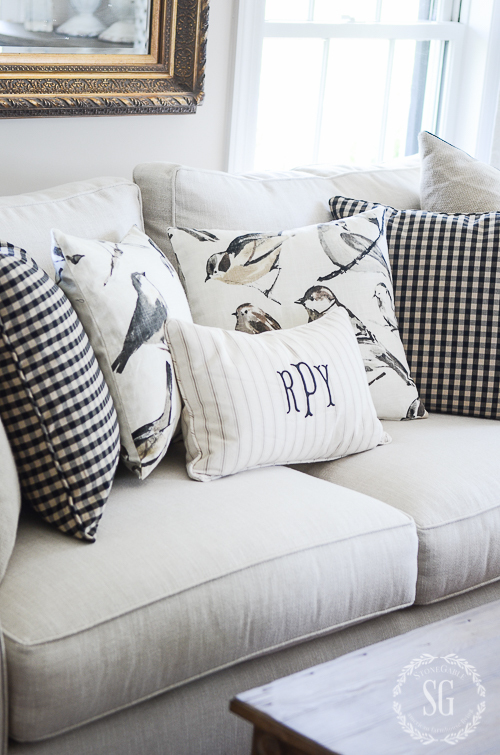 I love the bird fabric used on the pillows on your couch. Any idea of the fabric name? I make my own pillow covers. Great idea, and I have a basket that’s already lined in mind. I’ve hung onto it for quite a while knowing that a perfect use for it would come along. Thanks! I loved the idea of giving the gift of prayer to those who send Christmas cards. We usually make sure we send them a card, also, but how important it is to also pray for friends and loved ones. The idea is also one that brings our families together in a seasonal focus that is spiritual instead of commercial. Love this idea. About damaging the pillows from the rough interior of a basket: you could make a custom lining with your favorite material and whip-stitch it to the top through the basket or glue gun it in place OR tuck a drop cloth in and let it extend over the top edges of your basket and wrap a large ribbon, cord or a leather belt form the thrift store around the top edge of the basket to keep the fabric in place, that way you could make seasonal changes easily. I love pillows, my clan does not! So this is a great compromise! I do keep a large basket of throws for my cold-natured guests, however. Will now have to get a pillow badket as well. If I were there, you wouldn’t have to put the pillows in a basket because I would sit on them! Awesome! My clan finds them annoying, but I do not! I also have a basket for extra throws for the more cold-natured of my friends. After reading your post on pillows, I thought what a great idea. I love making pillows and have several around our home but was running out of places to put them when not in use. Your idea of a basket was great, thanks! I have a bamboo cart sitting in my living room that I usually use for plants…but now was empty. So I repurposed it with pillows and extra throws ( which I place over the handle). It looks great and everyone remarks on what a good idea. Thank you for your great blog. I love your blogs and ideas. Thank you for all you do. Do you have any tips for storing placemats? Mine always seem. To end up in stacks and I forget what I have. Where did you buy the bird pillows? They are perfect! I too use a basket, so not to damage the pillows I made a duck cloth liner and tied it to the handles, doesn’t take up too much room and looks good when the pillows are back on the sofa/chairs. Whenever I see pillow mountains, I sit on the whole mountain! Right back at you, Cindy! You are an inspiration in every way….through your life, your faith, your delicious recipes and your home decor. I look forward each morning to your posts. Glad to hear you are feeling better! This was one of those articles where I said to myself “Now why didn’t I think of that!” Great idea, I love it, thank you!!! Excellent post today. I had the same problem myself. I love pillows. Thank you. What a fabulous idea to have a pillow basket!! By the way, just started following you and I’m really enjoying your blog!! Well Hi Nilza!!! Welcome to the StoneGable family! So glad you’re feeling better! I really missed your posts. LOVE the basket idea. I had a big basket downstairs that I’m going to bring up for my pillows when company comes. So much better than piling them on the floor. I love my pillows and have made quite an investment in them. 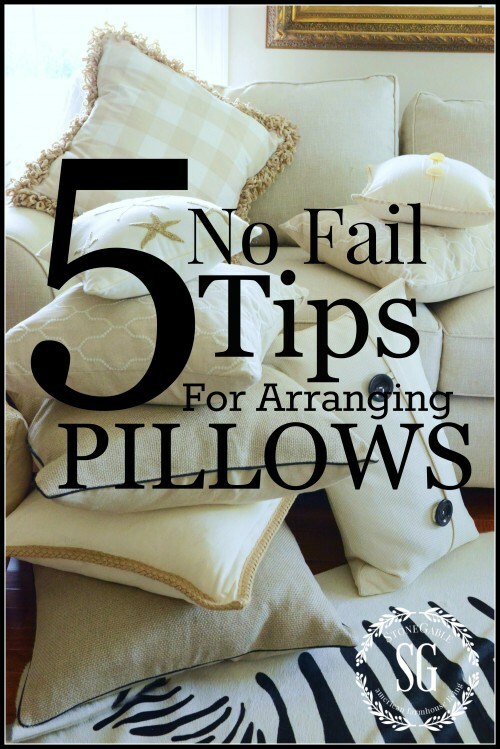 Your tip is a fabulous idea and simple solution to the problem of worrying about your pillows getting smashed, snagged, or thrown on the floor. I will definitely have my eye out for some pretty baskets. Thanks so much for your blog. I look forward to reading it each morning. I hope you get to feeling better soon. Take care!!! Thanks Fran, Still pretty under the weather, but at least I’m out of bed. UGH!!! Yvonne, thanks for the great solution! The baskets I have found seem to be either to narrow or too deep. Will you share the dimensions of this basket? Thank you so much! Blessings! I have so many baskets, but did not think of using it to hold my pillows. Thanks for the tip. You always have such great advice. I have been wanting some baskets from Hobby Lobby and now I have a excuse to buy them!!! Of course, I need two more pillows to follow your pillow tutorial about how to arrange them. Thanks for your sharing on something so simple. I love this idea and have the perfect basket for the pillows. Thanks. So clever as always. Missed you while you were sick! Glad you are feeling better! Love your big basket! I use a similar one for throws; need to get it ready for pillows! On a different note: have you done a blog on your laundry area? Would love to see that part of your home. I noticed your retractable clothesline on your back porch! Also, really looking forward to your office project! Have a good day! The laundry room reveal is about 2 weeks out and my study won’t be ready until mid summer. Thanks for keeping track! Any ideas to keep pillows where they belong on a leather sofa? They keep sliding off! Hi Karen – I have the VERY same problem so at one end, I toss a throw over the back of the sofa (at the end) then drape it a bit over the arm and then a little on the end of the left or right seat area. Then, at least, two of my cushions/pillows stay in place. At the other end of the sofa … well, that’s another story! 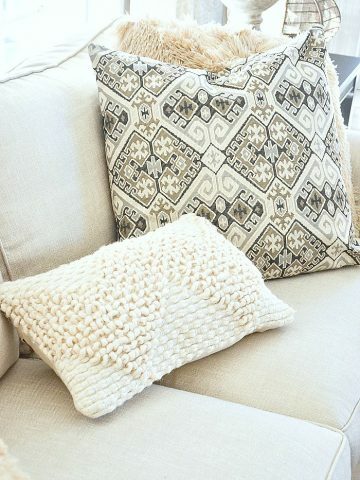 I wouldn’t like the look of two throws on the sofa so sometimes, if a cushion/pillow has tassels at each of the four corners, I try to tuck a tassel under the cushion/pillow and that seems to help solve the issue of “sliding cushions”. Sorry – we usually use the word “cushion” in Canada; or at least, where I live they do. “Pillows” are the ones that go on a bed. lol! Maybe it’s the material you sofa or pillows are made from? I like to choose pillows that have a little texture to them and that keeps them from slipping off my sofa. Great solution Yvonne! I will be looking for a bargain or two for baskets. Now, if only I can keep my cute little yorkie from tossing them on the floor! Thanks for the great ideas. Yvonne, do I need to look for a particular weave of basket so it will not snag the material on my pillows? Just check the inside before you buy a basket to put pillows or throws in. Make sure there are no areas on it that would hurt your pillows. Great question Kathy! Where did you get that fabulous basket?? Hi Debbie, I found this basket at our local HomeGoods. They carry amazing baskets! Did you find it recently? It’s really gorgeous! I found this basket a few years ago. But HomeGoods does carry amazing updated baskets! Wonderful idea! Love that basket! Now to find one. I agree…great idea! 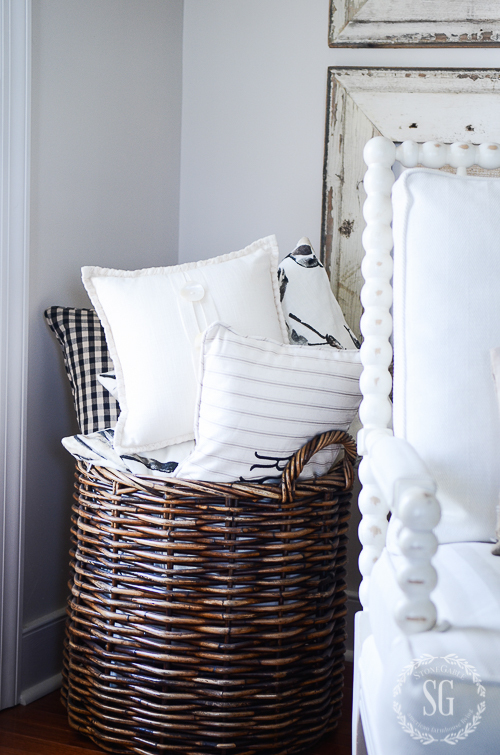 And who doesn’t LOVE baskets as much as we do pillows! Great idea, Yvonne! I’ve always wondered what to do with pillowes when company comes. I hate when they get smashed. Grr! Where did you find that gorgeous basket? Beautiful idea!!! Glad you are feeling better. I had “the whatever” a few weeks ago—not good. Have a good week and take it as easy as you can. How did your mentor situation work? You gave me the courage to ask a lady at church about mentoring me for my art sales and using Facebook, etc. to sell my paintings. I’m trying to get my nerve up to start blogging again. Look forward to your news every day! Hi Madelyn, I hope you will start blogging again! It’s the best and as you can see you meet so many fabulous new friends!